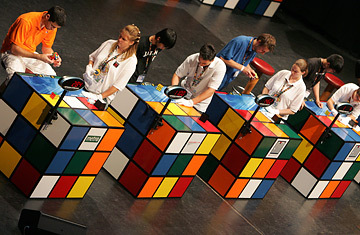 Competitors in the 'Classical Category', compete to solve the Rubik's Cube. After a weekend of tense competition between 263 of the world's top competitors, 16-year-old Yu Nakajima of Japan was declared the winner of the main event of the 25th Rubik's World Speedcubing Championship, which was held in the Hungarian capital on Oct. 6 and 7. In addition to solving the "classic" 3X3 Rubik's Cube five successive times with a world-class average time of 12.46 seconds, Nakajima also earned 5,000 euros ($7,016) in prize money and now stands at the pinnacle of perhaps the world's most unusual sport. The 25th event also saw the speedcubing world championships return to its "home" of Budapest where the Rubik's Cube was invented by academic and architect Erno Rubik in 1974, and where the sport's first world championships were held in 1982. More than 250 competitors from 33 countries made the trip and competed in events such as the 4X4 cube, the 5X5 cube, and foot solving events, in which cubers shed shoes and socks and manipulated the puzzles with their toes. Arguably, the most challenging was the blind events, where competitors studied puzzles, donned blindfolds, and solved cubes by memory. Matyas Kuti, 14, of home nation Hungary stunned the Rubik's community by solving 18 successive cubes while blindfolded over a span of just 46 minutes (he was able to take off his blindfold between puzzles and briefly study each new cube): a performance that tournament spokesperson Ray Hodges hailed as a work of "genius." The tender ages of many of the competitors belied the championship's accessibility. Both six-year-old Daniel Hop and 64-year-old Grada Ooms, members of the Netherlands' team, traveled to Budapest in an attempt to qualify and compete. Like many others, innate ability propelled Hop and Ooms, respectively the youngest and oldest competitors in the 2007 championships, to the sport's most prestigious tournament. Ooms solved her first cube only six months ago whilst young Hop has been cubing for only a year. Although to the uninitiated, winning a speedcubing championship may be the ultimate 'Revenge of the Nerds', the competitors at the 2007 World Championships appeared to be a varied and balanced lot. Families competed (Daniel Hop attended with his father and fellow cuber Michel Hop, 38), and both sexes were represented in the events. But where the majority of cubers competed for status among the little-known speedcubing subcultures of their home countries, for others fame and fortune, relatively speaking, was at stake. As cubing has potent mainstream appeal in Japan, the six-member Nippon team was followed to Budapest by two television news crews. And according to other cubers, the Japanese contingent, surrounded by an adoring entourage and paparazzi, arrived at their hotel on the eve of the championships like "rock stars." The cube's taciturn founder Erno Rubik, 63, even made an appearance on the last day of the event and awarded prizes, dispelling rumors that he was distancing himself from the sport. "I'm glad the cube is reaching new generations," he said, "who face it with fresh wonder, curiosity and enthusiasm."